Joey and Rory Feek were enjoying a steadily growing fan base in country music when Joey was diagnosed unexpectedly with a rapidly spreading cancer. This vibrant and beautiful young woman would soon be on a unique journey for which no one is ever fully prepared. Her husband, Rory, and children, Heidi, Hopie, and Indiana, were beside her every step of the way. Rory, a prolific songwriter, entrepreneur, farmer, and overall tender man, has seen God bless his life in countless unexpected ways and had started a blog, thislifeilive.com, not really knowing its purpose other than he needed to write. That purpose soon became clearer when Joey's cancer battle hit. By inviting so many into the final months of Joey's life, this astounding couple captured the hearts of millions with their powerful love story, the manner in which they were handling the diagnosis, and the inspiring, simple way they had chosen to live their lives. In this vulnerable book, Rory takes us into his own challenging life story and shows what can happen when God brings both his presence and the right companion into our lives. He also gives never-before-revealed details on what he calls "the long goodbye," the blessing of being able to know that life is going to end, and taking advantage of it. He shows how we are all actually there already and how we can learn to live that way every day. He also goes into detail toward the end of the book on what it's like to try to move on with your life once you've "had it all." *Also available in paperback on 2/6/18. You can pre-order your copy of it today! *Also available in paperback on 2/6/18, but you can pre-order your copy of the paperback now! For press inquiries only, please contact Dawn Kamerling at The Press House at dawn@thepresshouse.com or Becky Melvin at HarperCollins at becky.melvin@harpercollins.com. 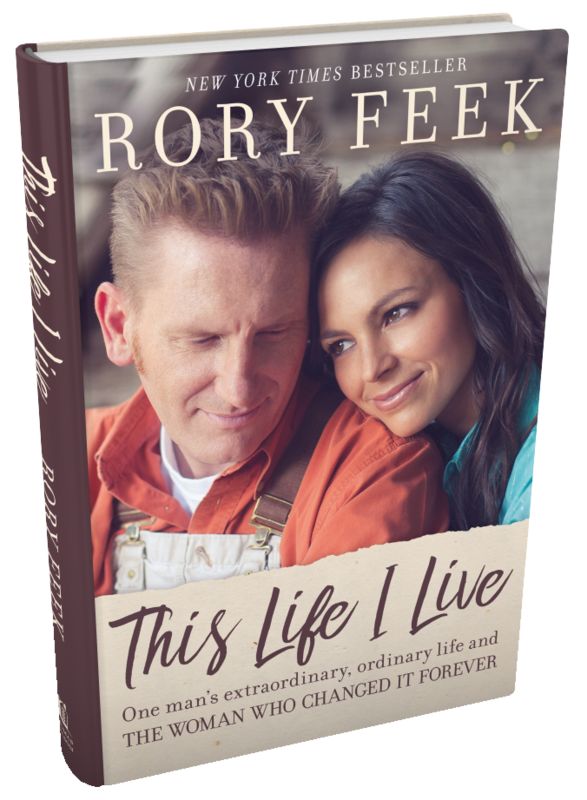 A true renaissance man, Rory Feek is known as one of Nashville's premier songwriters, entrepreneurs, and out-of-the-box thinkers. He is a world class storyteller that crosses all creative mediums from music and film to books and the Internet. As a blogger, Rory shares his heart and story with the world through his thislifeilive.com blog that has over 2 million Facebook followers. The love story of he and his wife, her recent battle and loss to cancer, and his vignettes of unwavering faith and hope in the face of tragedy inspire millions of readers who follow along with each post. As a songwriter, Rory's written multiple number-one songs, including Blake Shelton's "Some Beach", Easton Corbin's "A Little More Country Than That", and Clay Walker's "Chain of Love", and had dozens of other songs he's written recorded by Kenny Chesney, Randy Travis, Reba, Trisha Yearwood, Waylon Jennings, and many others. As an artist, Rory is one-half of the Grammy nominated country-music duo Joey+Rory. He and his wife Joey Martin toured the world, sold hundreds of thousands of records, and had their own weekly hit television show that aired all across the country on RFD-TV. Their latest album "Hymns That Are Important To Us" sold 70,000 copies the first week and debuted at number one on the Billboard album charts. As a filmmaker, Rory just finished directing his first feature-length film, "Josephine", an epic love story set during the declining months of the Civil War, with a screenplay that he co-wrote with Aaron Carnahan. Rory has three other screenplays in process. He also writes, shoots, and edits their music videos, and is the creator of the TV shows and specials in which he and his wife appeared. He and his 3-year-old daughter Indiana live an hour south of Nashville in an 1870's farmhouse near their family-owned diner, Marcy Jo's Mealhouse.